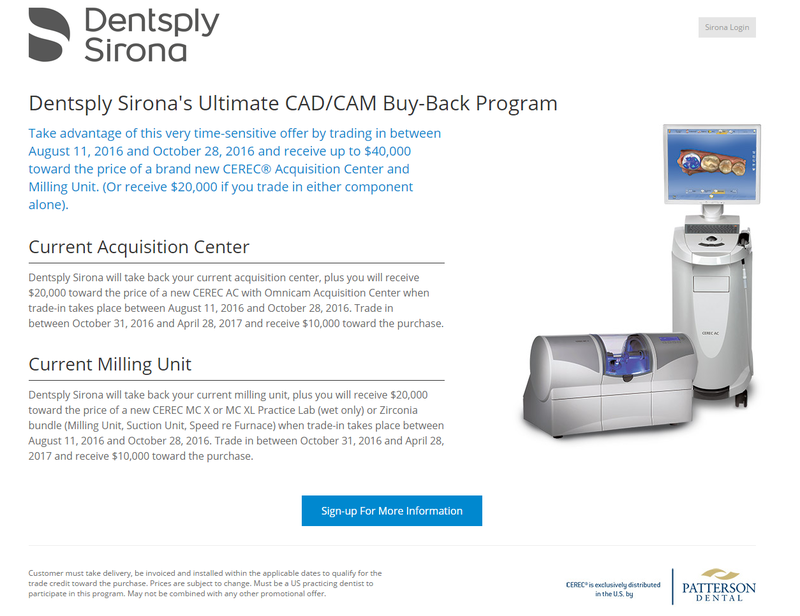 Sirona Trade in Your Used Cerec for BIG BUCKS! Patterson is offering outrageous trade in offers on anyone's old, non-working or out-dated Cerec technology for big bucks! For those buyers that are not comfortable with buying anything used and MUST have the new price tag, then this trade in program is right up your alley! As a Used Cerec dealer I can tell you this is the only time and only place on the planet your going to fetch outlandish prices for out-dated Cerec technology. The discounts are steep, but still can't compare to a gently used unit that is priced at 30-50% less than the new price tag. Turn your Used Cerec from DUST into CASH! Why CASH IS KING when selling your Used Cerec.....rapid depreciation, time is of the essence! Used Cerec technology......cost, truth, value, resale and when to buy? Get the 411 on how to BUY Cerec Technology!